We provide a vast number of customers such as education institutions, Japanese language schools, vocational colleges, international institutions, and leading manufacturing companies with e-learning services. We also dedicate ourselves to develop study materials for corporate customers. "Japanese Learning Course for Foreign Learners" is our original Japanese language learning material. The courses are made so that they suit the levels of the Japanese Language Proficiency Test, a test used all around the world to measure the Japanese- language proficiency. Our Learning material is suitable for various purposes such as for job training in corporations, Japanese language education for foreign employees, and for lectures in Japanese language schools and education and other education institutions. It is provided in the e-learning style using the newest information media to meet the needs from corporate customers. Learners can take Japanese language check test! We provide the leaners with "Japanese Language Check Test, which can be taken on PC, iPhone/iPad, Android devices, other smart phones, and mobile devices. they can check their level of understanding Japanese. Corporate administers can know which course has been watched for how many hours by each learner and the results of Japanese check tests in detail. The administration tool can be used on not only PCs, but also iPhone/iPad and Android devices. This enables the users to check the learning states and quiz results anywhere. Extra learning materials can be offered! We can provide 570 video learning materials in various themes from IT to business skills. They can be offered so that the learners can make the most use of their spare time to improve not only their Japanese but also their skills required in business scenes as Japanese business manners and how to use Microsoft Office software. We are happy to help corporations to install LMS services and streaming distributing services. Please feel free to contact us to get more information. English subtitles make it easier to understand even for Japanese beginners. The course contents correspond with each level of JLPT. Easy to know what level the learners are at. Cost reduction! We realize Japanese language training and education at a considerable low price. No limitation in the number of users! Easy to keep track of the learning states! Each company can set their own standards to evaluate the learners'' Japanese level. We support certificate issue. Easy-to-understand e-learning videos. 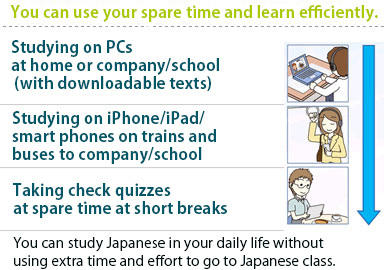 You can study Japanese anywhere, anytime! Courses at different levels available. Japanese Language Tests help you to check your level of understanding of the lesson contents. Certificate of completion assures your Japanese proficiency! Inquiries about language learning plans and content are welcome. Education institutions, Japanese language schools, vocational schools: The materials are available at any time without limitations 1 year Please contact us. Individual users: Please purchase DVDs (available only in Japan). Please refer to our DVD price list. We can offer discounts according to the number of users in a corporation or institution. Please feel free to contact us. We have been dedicating ourselves in producing educational visual contents since our establishment. Attain makes the best of training know-how over many years and multimedia technology. We also have a rich experience of serving customers with educational materials development and have received a favorable reception. Specifically, we are expanding to provide practical e-learning for good study environment which makes good use of interactivity of network, such as private study by flash and the accumulated usage of on-demand study content. We are passionate to make most use out of our skillful know-how in educational materials production, multimedia technology, and network technology. 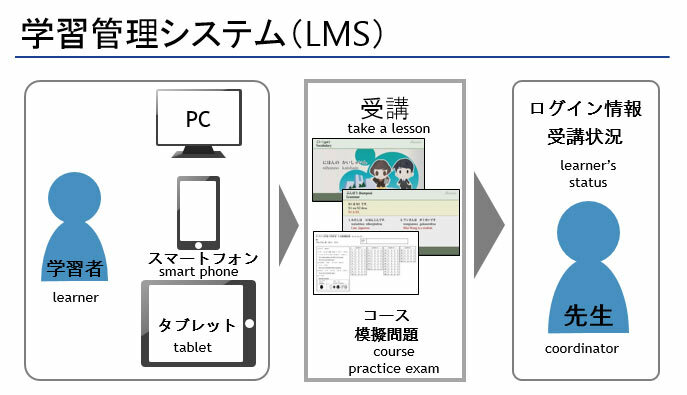 We support customers' e-learning application.